Copyright © 1992 Marilyn Leavitt-Imblum. 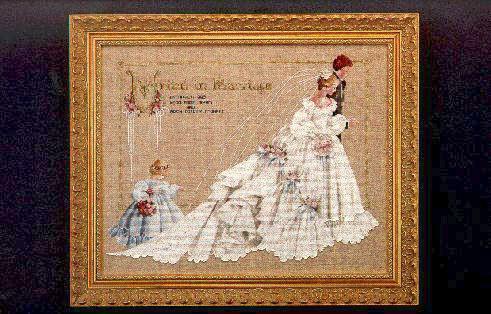 This design includes bride, groom, and flower girl. It has a double printing with an easier way to do large areas. Also gives hair color changes and African-American color selections. Stitched on 32 count Antique Green or Natural Linen (2 over 2) from Wichelt. 14 1/4" x 18 3/4"